Tommy Joe Coffey was a solid receiver and place kicker throughout his 14-year career. He was nominated seven times for the Schenley Award for Most Outstanding Player award and was the runner-up in 1962, 1967, and 1970. Coffey scored a total of 971 points on 65 touchdowns, 204 converts, 108 field goals and 53 singles. Coffey was the CFL scoring leader in 1962, 1967, 1969, and 1970. 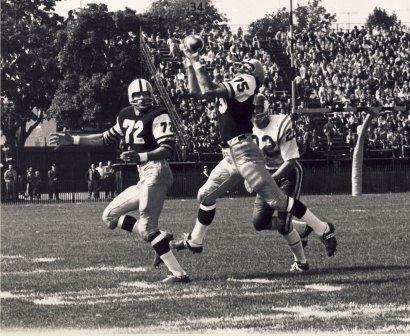 Coffey caught 650 passes for 10,320 yards, and was the CFL’s pass reception leader in 1962, 1964, 1965, and 1969. Tommy Joe Coffey is also honoured on the Edmonton Eskimos’ Wall of Fame.